A dog competes in the Masters Agility Championship during the Westminster Kennel Club Dog Show on Feb. 10, 2018, in New York City. 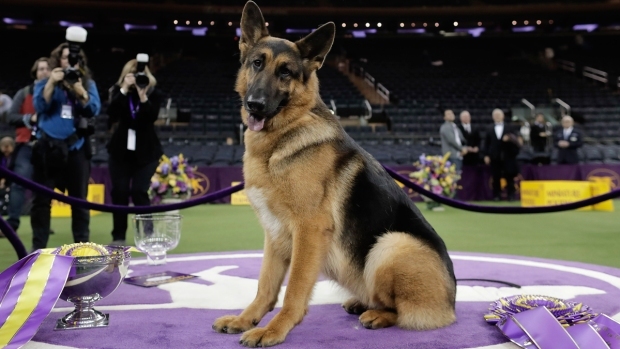 Best in Show at the 142nd Westminster dog show will be awarded at the end of the competition on Tuesday, Feb. 13. When your name is famous, you've got to live up to it. Not far behind, a Chihuahua-terrier called Jefe was the top mixed-breed agility dog at the nation's most prominent dog show. Jefe was part of a litter of starving puppies rescued under a house where they had been for over 4 weeks, handler Liza Buckner said. She says now, he can deal with pretty much anything thrown his way. "He's just a cool little dog," said Buckner, of Sebastopol, California. As many as 330 dogs, from Yorkshire terriers to German shepherds, vied for the championship. Others seemed to be going for a crowd-charming title: An English springer spaniel named Mia and a Pomeranian called Kenzi both got chuckles and cheers for taking time out from their final-round runs to survey their admirers from the top of a peaked ramp. Not to be outdone, some pedigreed cats had a go at agility at a companion event next door showcasing both dog and cat breeds. For cats, agility "just puts structure on something they already do," Vicki Jeffers of Califon, New Jersey, said as her 4-month-old Bengal kitten, Spots, got the hang of it. 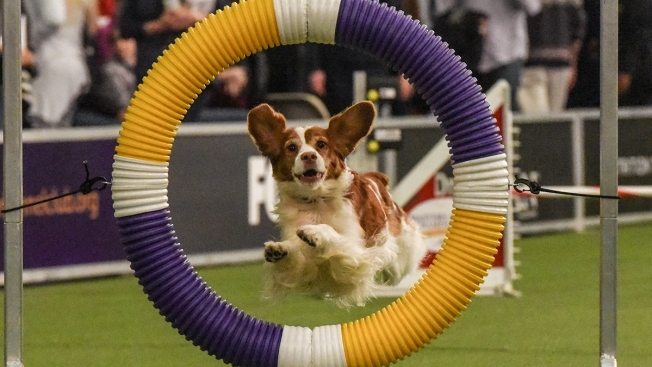 Westminster, now in its 142nd year, added agility in 2014 to incorporate an increasingly popular sport - and with it, mixed-breed dogs. A record 29 of them signed up to compete this year. The more traditional part of Westminster, featuring 2,882 entries, begins Monday morning and leads up to the best in show pick Tuesday night at Madison Square Garden. That's not to say dogs can't do both: A 6-year-old Doberman pinscher named Chester competed in agility and is headed back for the traditional judging. It's the first time at Westminster for the Doberman, owned by Steve Garcia of Massapequa. Agility winners so far have all been purebred. Fame(US) was one of 55 border collies entered Saturday. But contestants like Valur the Saluki came from breeds seldom seen at agility trials and made it to the finals. Some dogs have to overcome built-in agility challenges. Spec the longhaired dachshund - or "the Weavin' Weiner," as owner Carole Krivanich calls him - has short legs and an extended torso. And then there's his scent hound's nose. "For him to run along the ground and not stop and smell anything is a challenge," said Krivanich, of Milton, Delaware. Handlers praise agility as an outlet for highly-energy dogs, a confidence-builder for shy ones and an activity that forges a special canine-human connection. Dogs and handlers both have to learn to understand each other's behavior. 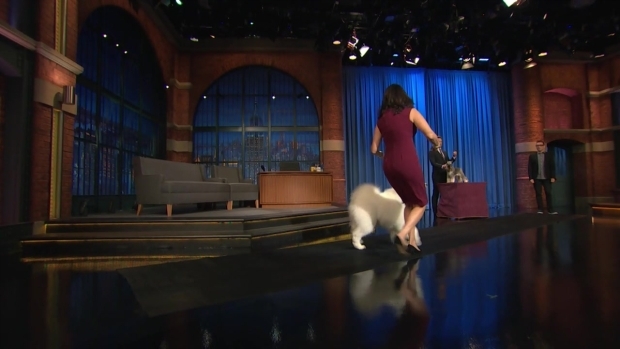 Host Seth Meyers teams up with a miniature schnauzer to prepare for the upcoming Westminster Dog Show and learns how to be a medal-worthy handler. "You're teammates. It's not just like having a pet," says Leslie Holm of Las Vegas. She never envisioned herself doing dog agility before adopting Riley Nico, a mixed-breed that signaled her interest by jumping over benches and weaving around people at a dog park. Holm has plenty of experience pulling together bigtime performances, as a former longtime lighting technician and electrician for acts ranging from Beyonce to Bon Jovi. But guiding Riley Nico through their Westminster Kennel Club debut? "This gives me butterflies," Holm said, with a smile.